Muslims are not a destructive minority here in North America but an integral part of the Americas even before Columbus!!! 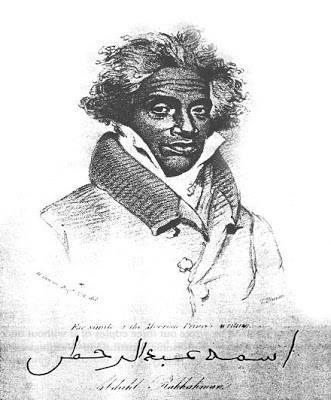 Did you know that Amir Abdur-Rahman Ibrahim Sori, a West African Prince and leader of a huge army, was captured, brought to Mississippi in 1788, remained 40 yrs as a slave and eventually won his freedom? ” Look at this amazing depiction of the 18th Century with the actual Arabic writing of Abdur Rahman! The Series “Getting to Know the Companions of Muhammad pbuh” will take place at Masjid Tuanku Mizan also known as the Steel Mosque in Putra Jaya, Malaysia daily after the taraweeh prayers.